It’s always a great time to start planning your first true Kiwi hut experience. Powell Hut is extremely popular and the fastest way to the top of the Tararua Ranges in Tararua Forest Park. The spectacular views are only a 1.5 hour drive from Wellington, easily accessed by Holdsworth Road near Masterton. The near new Atiwhakatu Hut is an easy walk from Holdsworth Road. It’s popular as part of the beautiful Jumbo Circuit – a two to three day tramp involving a climb through beech-podocarp forest to some of the best alpine views in the Tararua Forest Park. “The Holdsworth area in the Tararua’s is perfect for an overnighter. I recently walked to Atiwhakatu Hut with my girlfriend. It’s an awesome walk.” – Matthew Robinson, DOC Web Assistant. Further north of Wellington, “Rangiwahia Hut is quite cool.” Says Jack Mace, National Advisor for Operations. Totara Flats hut is found on the Holdsworth to Kaitoke Track, Tararua Forest Park. The track follows the Waiohine and Tauherenikau Rivers for 36 km between Holdsworth and Kaitoke and is a good introduction for trampers new to the Tararuas. “A couple of female friends got all dressed up and walked in for a proper ladies afternoon tea once. Think it gave the old guys at the hut a bit of a surprise.” – Recreation Manager Richard Davies. Aotea/Great Barrier Island is Auckland’s only multi-day wildness walk in the region. The Aotea Track features Mt Heale Hut with breathtaking views. “The track takes you through magnificent scenery to secluded hot springs and waterfalls” – Jana Beer, DOC’s Auckland Office. Great Barrier’s Kaiaraara Hut offers rustic charm. The track has a combination of easy walking tracks, boardwalks, steep climbs, stairways and bridges, and is suitable for reasonably fit beginners or experienced trampers. Depending on your fitness level and how you plan to walk it, the Aotea/Great Barrier Island tracks can be completed in two days and one night, or three days and two nights. The Mount Somers area in mid-Canterbury has amazing volcanic formations and deep canyons. A group of keen locals built the tracks, forming the Mt Somers Walkways society. It’s a 1-3 hour walk to the hut or, a few days if you take the more advanced track – Mount Somers Track. There are a couple of trails to choose from to get to the historic Packhorse Hut. The hut was planned as part of a series of ‘rest houses’ for those journeying between Christchurch to Akoroa. The shortest walk to get there takes about an hour 20. If you want a true taste of history, this is a classic example of an original New Zealand musterer’s hut. You’ll be pleased to know that the original uncomfy chaff sack mattress bunks have been replaced. It’s a beautiful walk in through the famous Arthur’s Pass area. All of these huts are short walks (under 4 hours to walk to). Do you have a favourite hut you would recommend? Share your recommendations below. Waitawheta Hut in the Kaimais is a beauty. Easy walk up the valley, great bridges, history and old volcanic landscape. Nice hut and even a glow worm grotto out the back! The Kowai hut at the base of MT Torlese is a nice hut with a easy 90min walk in. It serves well as a base for a trip over Torlese and back around Red Peak and down to near the head of the Kowai river.Or a trip up to the Gap These trips ire moderate to hard and time around 9 to11hrs. You do need to get permition from the managers Stu or Jerry Gunn at Brooksdale station. Thanks Russell – a great spot. Blue Range Hut in the Taraura’s is a favourite of mine! It’s a bit steep, however well worth it. Another good one is Mitre Flats hut also in the Tararua’s. We’re lucky to have so many great spots close to Wellington. 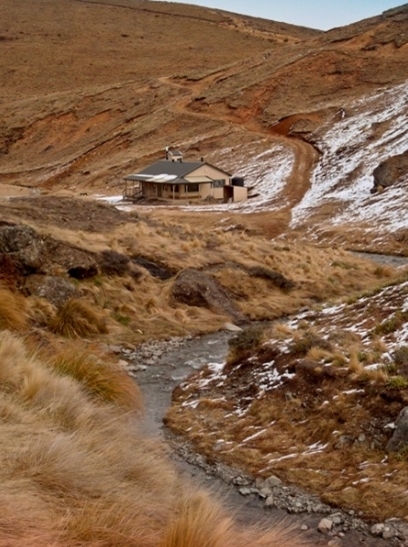 Great photos and article about NZ tramping huts. I agree also that we need to thank those people who help to look after them. We are so lucky to have so many wonderful huts to choose from in the most idyllic locations. Thanks to all who look after them. There’s some fantastic spots. With over 950 it’s hard to pick favourites!